So in the eighth inning last night, the Mets allowed a run for Baltimore for the first time in the three-game series between the teams. The run snapped a season-high 29-inning scoreless streak for Mets opponents, and it's the third time this season the Mets have gone at least 25 consecutive innings without allowing a run. According to Elias (via ESPN), in the 50-year history of the Mets prior to 2012, they had just one other season with three such streaks — the Miracle season of 1969. It's here we'll remind you that the Mets pitchers this season matched that feat in just 70 games. 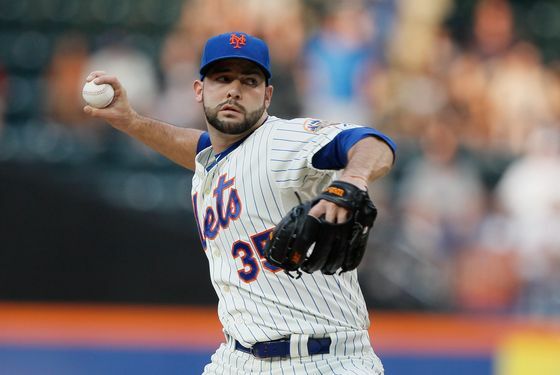 Last night, it was Dillon Gee who impressed, allowing three hits and two walks over seven and a third innings, while striking out nine. That said, he allowed two runs, and we'd like to imagine Johan Santana and R.A. Dickey mocking him in the clubhouse afterwards for doing so. Things got interesting in the ninth, because it wouldn't be a Mets game this season without at least a partial bull-pen meltdown, but after allowing the Orioles to pull within a run, Frank Francisco got Brian Roberts to ground out to second with the bases loaded to end the game. The Mets have now alternated getting swept and sweeping opponents for four straight series: They were swept by the Yankees, took three in a row from Tampa Bay, dropped three straight to the Reds, then swept the Orioles. So basically, no one's more pleased with their results over the past two weeks than Yankees fans. And speaking of the Yankees, they'll be at Citi Field for the second of 2012's Subway Series beginning tomorrow. The good news for the Mets? The Yankees have cooled off some after an impressive ten-game winning streak. The bad news for the Mets? They did so by losing a series to the N.L. East Braves.